The community school movement represents a promising approach to school reform that brings much-needed attention to the intersections of child, family, and community well-being. Although the community school movement of today shares many core values and goals with school social work, it has undergone a different developmental trajectory. As a result, operation of the community school model may, no matter its implementation phase, overlook the potential of school social workers. 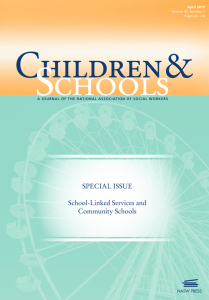 A recent issue of the journal Children & Schools, co-published by NASW Press and Oxford University Press, features an article on the issue of social work and community schools. Relying on interview data exploring the experiences of school social workers at designated community schools in New Mexico, this study describes the various ways in which they were either involved or overlooked in the process. Their stories highlight the need to ensure that school social workers are integrated into community school initiatives and suggest that school social work leadership in these initiatives can support and improve implementation. I am interested in this approach. Is the attachment an article that you can forward to me? How can I become involved in this programme. I am a qualified Social Worker.